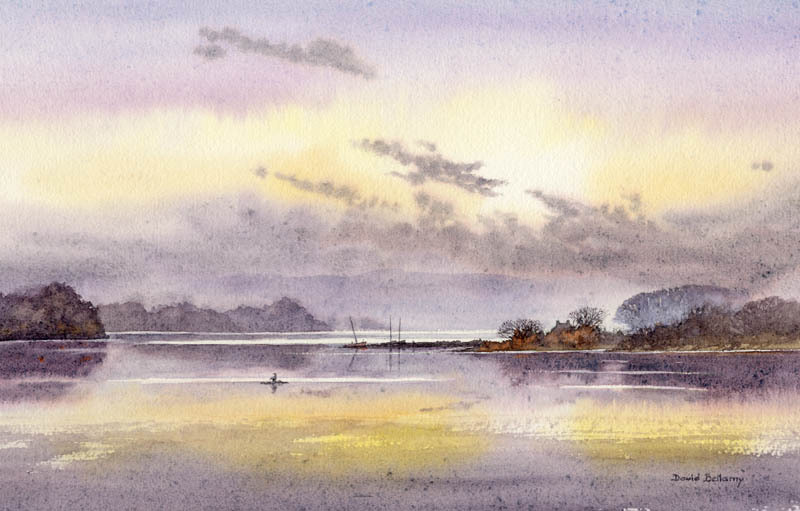 Skies, Light & Atmosphere is the theme of my watercolour demonstration and seminar at Great Bookham in Surrey on 5th October, three inter-linked elements that play such important parts in landscape painting. 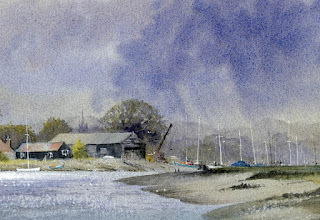 The event features a demonstration followed by a coffee break and then an illustrated talk covering a multitude of scenes showing techniques for achieving a great many effects for skies and atmosphere, and how to make the most of the light in a variety of forms. 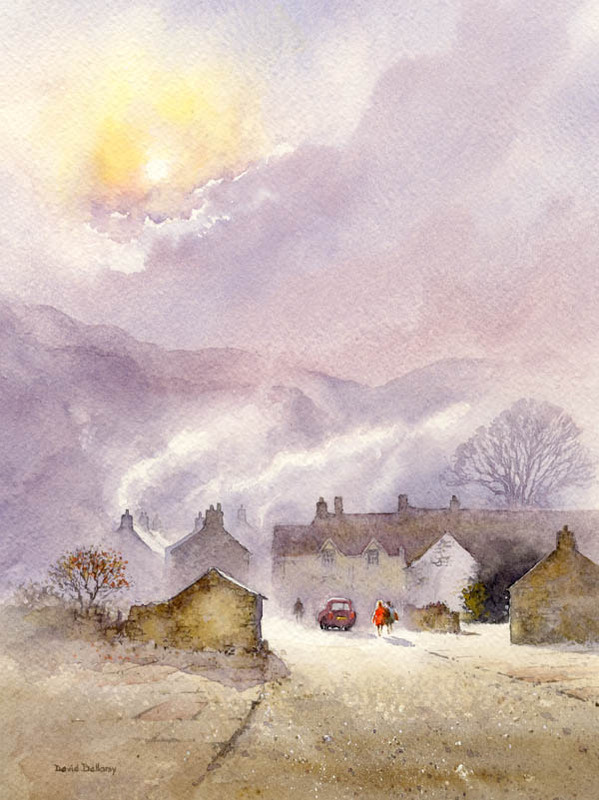 This watercolour of the lovely old village of Bradwell in Derbyshire embraces all three of the elements I shall be covering in the seminar. 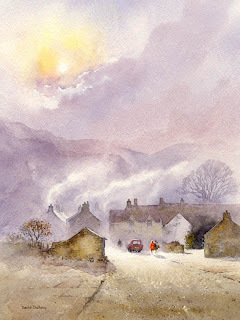 Early morning mist creates an atmosphere that loses a great deal of background detail, aided by smoke drifting up from the chimneys, while the backlighting lends itself to a dramatic effect, the figures caught in the sunlight have haloes around them – achieved by leaving the immediate surrounding rim of their bodies as untouched white paper. The most intense light in the sky is also untouched paper, as are the silver linings, the rims at the edge of some of the clouds close to the sun. 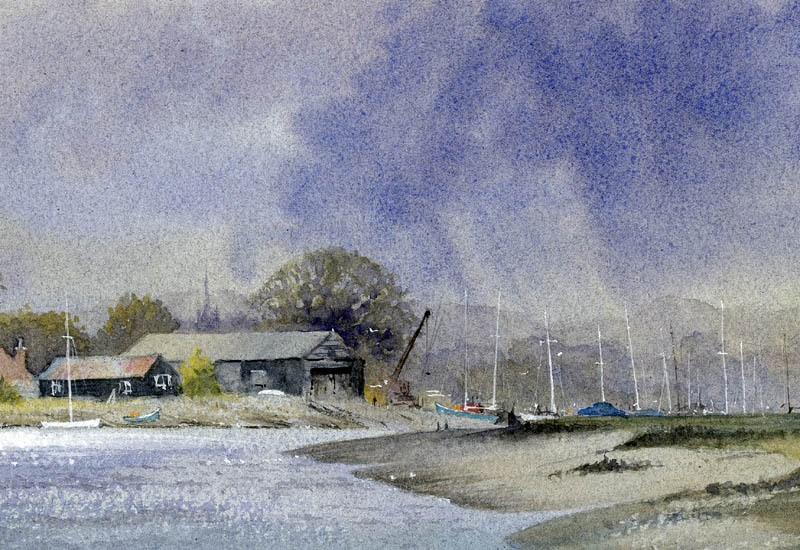 Much of the sky has been rendered with a wash of French ultramarine mixed with cadmiun red, and this has also been taken down into the background behind the immediate houses, thus retaining a sense of moody unity which a lot of conflicting colours would destroy. My exhibition starts on 5th October at the Lincoln Joyce Fine Art gallery at 40 Church Road, Great Bookham in Surrey on the same day as the seminar which takes place in the hall opposite the gallery. 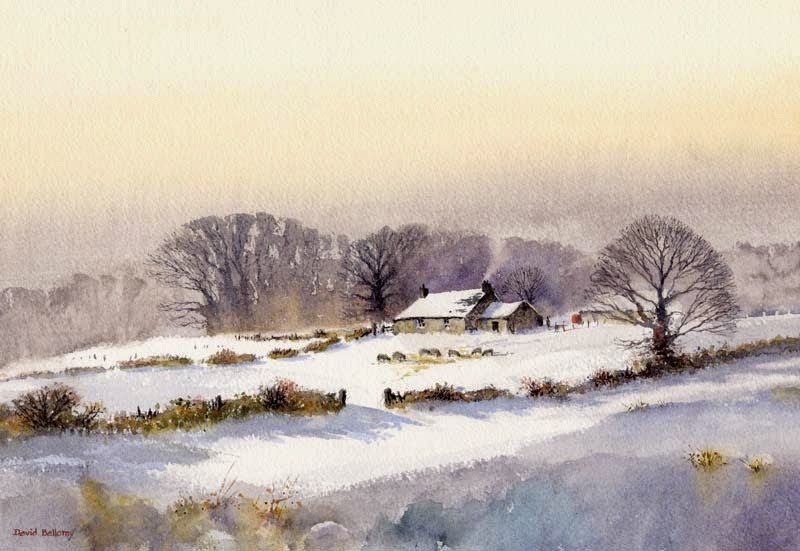 The gallery telephone number is 01372 458481. The seminar starts at 1pm, although doors will be open at 11 am for a discount sale of art materials, books, etc. Entry is by ticket only and you can book online at http://www.davidbellamy.co.uk/ Click on seminar tickets in shop menu.